We’re obsessed with this skillet baked seafood dip with crab, shrimp and veggies. It’ll be the first dish licked clean at your next party or potluck! It’s extremely challenging for me to resist face-planting into my food while photographing it. The first time I made this delicious dip, I took ten shoddy photos before clumsily diving in with a torn piece of baguette. I made a considerable dent before deciding I had just enough left to photograph the following day. That was the plan at least. I forgot I have a husband. The kind of husband who comes home from an 11 hour day, sniffs out the newest creation to take up real estate in the fridge, and spoons it into his face like the man has never seen food before. Round two gave me maybe six or seven extra shots before it suffered the same fate as the first round. I also bare-handed the skillet again. If you need me I’ll be posting sticky-note reminders threats to myself throughout the kitchen while I polish off the remainder of this freakishly amazing dip. Cheese cures all ails. This scrumptious seafood dip is one of our all-time favorites! This piping hot dip is super versatile! Feel free to skip the celery and add extra bell pepper if needed, it’s great both ways! I also tested a batch with plain 2% yogurt in place of the cream cheese and it was equally delicious! The only issue is that it wasn’t, by nature, as creamy when you dunked on into it. I have to admit, though I love using yogurt in recipes, the richness of the cream cheese batch had me swooning with each bite. No shrimp? No problem! You can make the dip entirely with crab if you’d like. As always, feel free to add extra veggies; they’re delicious! I think it’s time to admit I have a cheese problem. 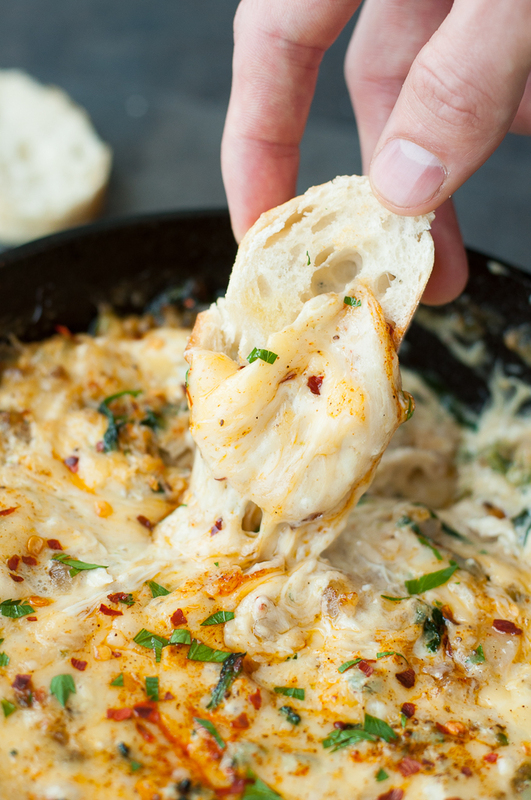 This easy cheesy seafood dip is oh so tasty! Once it was cool enough I even let Mia try a little bit and she wound up inhaling it and begging for more. Same goes for the husband, though I pretty much had no choice but to share with him, he’s my hand model after all! The recipe makes a boatload of dip so if you wind up with leftovers, no worries! They’re fabulous the next day, simply store in your fridge in an airtight container and hope your significant other doesn’t get to it first! Oh I guess I should describe the dip for you right? HOT, CREAMY, AND OMGCHEESY! 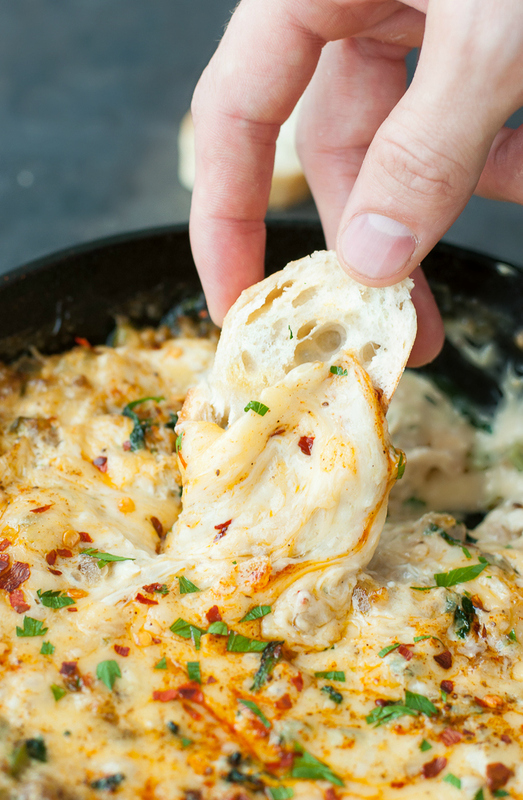 If you ‘re a fan of seafood and cheese you’ll basically want to bathe in this dip. The veggies add fantastic flavor but are diced small enough that they could easily trick your pickiest of friends. We all know that one guy who thinks green things should be illegal; those are the friends I enjoy cooking for the most. Challenge accepted! This scrumptious seafood dip is essentially the perfect party food so make a batch for your family and another to share with friends. Ok and a third to eat alone while you curl up in bed and re-read The Fault in Our Stars. You’ll need the comfort food, trust me. 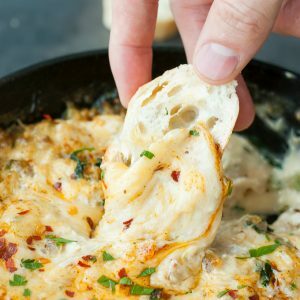 I’m hoping y’all adore this Baked Seafood Dip as much as we do! Let me know if you get a chance to try it! Feeling crabby? Snag the recipe for my Crab Stuffed Mushrooms! making this with fresh shucked steamed Maine crab meat. The fresh raw shrimp will be mixed with the other ingredients before it hits the oven. It takes 2-3 minutes, tops, to cook shrimp, or it will be like rubber. Take it from a Maine lobster fisherman’s wife and Rhode Island fisherman’s daughter ( Portuguese) It will be “GREAT” for the Superbowl game….GO Pats! Looks yummy, however it does not say the size of shrimp you used. Small, medium, large? Plan on making this for my wine tasting group. Sounds delicious and like a complete meal; however, as a Marylander, I can tell you that you NEVER shred lump crabmeat–it’s sacrilegious! If you don’t want the lumps, buy claw meat (actually tastier)–getting a LUMP of crabmeat in your portion is a real treat. Anyway, this dip has everything going for it – especially the crab. I’ve never served up a hot dip, but you have me seriously tempted. All those ingredients sound so lovely together. So full of seafood and cheese, what is not to love! Fabulous recipe perfect for so many occassions! I will try this soon. Look very tasty. Have you ever made & froze? I assume I would leave the shrimp out until putting it together to eat. I have a bunch of crab to preserve & looking for good ways to freeze. Hey Ann! I haven’t frozen this one before mainly because cheese dips don’t typically freeze well for later. On the bright side, from what I’ve read one of the best ways to preserve crab meat for a later date is to go the crab cake route and freeze them — YUM! In place of the cast iron skillet you can use an oven safe stainless steel pan to cook on the stove top and finish off in the oven, or just make in whatever pot or pan you have handy and pour the mixture into a casserole dish/baking dish to finish off the bubbly cheese topping. Yes!!! It all worked out good everybody loved it… it was so good I’m cookin it again now lol!!!!!! I was SO disappointed to find your recipe the day AFTER the 4th of July!! Cant wait to make & take this to our next “foodie friends b’que!” Recommendation: add cast iron skillet size(s) & other container options to instructions. (I plan to use 2 oval ceramic gratin dishes so they can be placed at both ends of a patio table that seats 8.) Have u tried this with anything besides bread…a good tortilla chip, maybe…so it’s not so filling as an appetizer? Also, you can skip cooking the crab in the skillet per step 7. Just combine it all and chill until you’re ready to bake. Crab is already cooked if you get it in a can or frozen in the store. A fish market will sell live crabs that you must steam or boil, then shuck the meat out. don’t cook the already cooked crab, Ever! Hi Jen you may or may not know of this by now but you can pick up a silicone sleeve for your iron skillet handles from Williams Sonoma or Cracker Barrel when you stopping along the highway for a nice meal or even Amazon.com. I just thought I would throw in that little tip to save your hands and your potholders. ??‍? What a fabulous, delicious and easy meal – uh, appetizer – that I have made 4 times now and counting. I have deleted manufactured and processed carbs from my diet for the past 4 months and my hunt for good food recipes never ceases. This one is superb. I’m not a crab fan, so I just sub in all shrimp, and add a little sharp cheddar to give it a bit more colour and tang. I know I’m late to post lol, but I just wanted to let you know that you’re paying something forward that’s great! Thanks! Definitely pinned! You had me at the photos of the bread scooping out the cheese 🙂 Can’t wait to try! Can you make this is a small crock pot? Cheese and seafood don’t usually agree with slow cooking. The cheese tries to curdle and the shrimp can get tough and overcook quite easily since it cooks so so fast. It would be great (after oven baking or even just cooking entirely on the stovetop) if it was put into a small slow cooker on the warming function for a party so the dip stays hot and melty but I would be nervous doing much more than that. Hey Marie! You could use a store bought shredded Italian blend of cheeses with a little extra mozzarella thrown in for melt-factor. That combo is always a hit when I make my spinach dip and it would be great in this too! 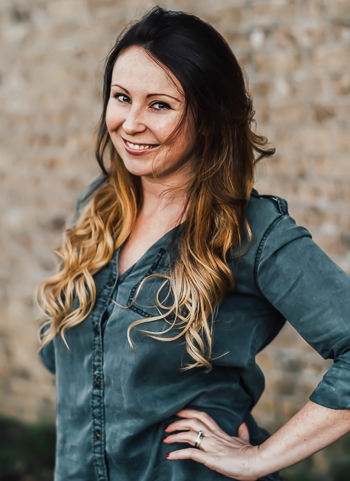 Hi Jenn, this morning’s post was so timely!! I am looking for some yummy appetizers and these look amazing! OMG it’s morning and I’m already starving haha! Thanks again, love your website so much! Thank you so much Sue! You certainly put a smile on my face this morning 🙂 I hope you get a chance to try this dip soon — it’s one of our favorites! Hello! Can I use a crockpot for this recipe? Do I need to add milk? Hi SK! I’m not sure how this one work work in a slow cooker, as I sautéed a lot of the ingredients and it cooks super duper fast on it’s own! The crock-pot would be great for keeping it warm for a party though so maybe it’s worth a try? Let me know if you try it! What if I don’t have a cast iron skillet could I use something else?? This looks absolutely amazing! Pinned. I would like to make this to take to an Easter Dinner on Sunday but I will not be home on Saturday. Do you think I could make it on Friday night and it would still be good on Sunday? Or what if I put it together on Friday and just baked it on Sunday morning? Will it still be good? Hey Jennifer! It’ll be fine it you prep it all Friday and bake it Sunday! I would make it in a regular pan instead of the skillet [you won’t want to put the cast iron skillet in your fridge] and store it in your favorite bake-safe dish. Another precaution you can take is to leave cooking the shrimp until just before baking on Sunday [it only takes a few minutes to cook] to avoid that weird rubberry texture you sometimes get when you cook shrimp and reheat it. You could also simply skip the shrimp entirely and use extra crab [I’ve done this, it rocks!] When I’ve made it sans shrimp and with extra crab I was able to prep it all ahead of time and pop it into the oven before serving and it was great. I’m totally rambling so hopefully this helps! Let me know if you have any other questions and I hope you adore this dip! <3 I love it so! Does that mean the shrimp won’t get cooked completely in the oven, if you don’t precook it a minute before adding? 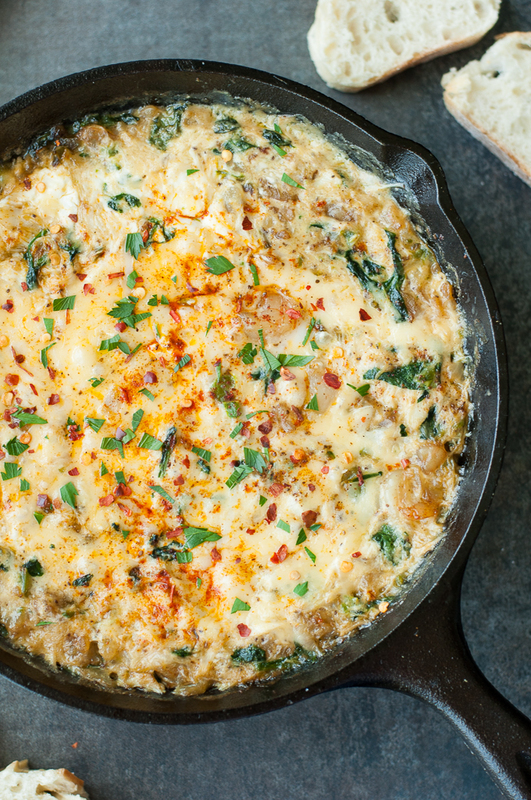 What size cast iron skillet do you use when you make this dip? Hey Sara! I used my big one! I’ll go downstairs and measure it and get back to ya in a few. I want to say its 11-inches but I could be totally off in eyeballing it. Talk to you soon! Hookay so it’s a 12-incher but I had lots of room in the skillet so I would say 10 or 11 inch will work too! Hope that helps! This sounds delicious, however, I have read this recipe 4 times and still haven’t seen where you add the crab meat. Just wanted to know what step do I need to add it in. Thanks so much! Just wanted to know because I definitely plan on making this!! Do you have any nutrition facts for these? This sounds amazing and I can’t wait until I have a party (and an ovenproof skillet) so I can try this out! Safe to say I’d better make this in the company of others or else I’d end up curled in a corner snarfing it down with my bare hands and hissing at potential takers. Well, Victoria Beckhams child. It’s THAT expensive. I can honestly say those pics made my mouth water and my stomach growl. Haha! I am the same, so clumsy, especially in the kitchen! I cut myself all the time and don’t get me started on my scars from burns – I just never seem to learn! Yum! This looks so delicious. And yay veggies! This looks amazing and reminds me of a favorite app at the restaurant back when I was a waitress. Can’t wait to try it! The kracken is on the prowl. Batten down the hatches. Plus cheese. All the cheese. I am in the same boat… one day I will learn that pot holders are there for a reason, and that walking and chewing gum at the same time is THAT hard. Today is not that day.